Author Val Tobin > What is Meditation? Every month, a group of people gathers at our home for the express purpose of meditating. We do at least one meditation, sometimes two, depending on the length of the meditation. After a long day at work, at least one person in the group will fall asleep, waking up as the meditation concludes, groggily ‘fessing up to being mentally AWOL. But that doesn’t mean that he or she receives no benefits from participating in the meditation. There is a popular saying that states, “Prayer is speaking to God. Meditation is listening to God.” When you begin to investigate and explore meditation, it’s one of the first things you hear from teachers, texts, and anyone else who has been meditating for any length of time. Regardless of one’s religious inclination, and whether you want to refer to God, Goddess, Source, Creator or something else, it expresses the meaning of meditation very well. Meditation consciously calms the body and mind. When you meditate, you sit in comfortable awareness, relaxing, slowing down your mind and body, though ideally not to the point where you fall asleep. However, as alluded to above, falling asleep does not mean meditation has failed. It means you needed the rest and can try again another time. Depending on the speed with which you fell asleep, you may even have achieved some period of meditation prior to slipping into sleep. Meditation takes you to an altered state of consciousness and this is evidenced by altered brainwave frequencies. In his book, Healing Sounds: The Power of Harmonics, Jonathon Goldman outlines the various levels of consciousness and their associated frequencies. He defines four categories of brainwaves: beta, alpha, theta, and delta. Beta waves are frequencies at 14 to 20 cycles per second or hertz. This frequency reflects the waking state. We enter the alpha state of 8 to 13 hertz when we are daydreaming or meditating. At 4 to 7 hertz, we are in deep meditation or asleep. This is also the level at which shamanic journeying and other shamanic activities are done. Delta waves of 0.5 to 3 hertz indicate deep sleep, profound meditative states, or healing. What Do You Experience When You Meditate? While you should approach meditation without any expectations, there are some things you might experience that are common in meditation. For example, most people find it difficult to relax and shut down the mind chatter when they first learn how to meditate. Even those who have been doing it for years will find that at times it is more difficult to shut out the day and sit in relaxed awareness. Others, as mentioned previously, have difficulty staying awake. While you are meditating, if you are psychically open, then you may receive information through one or more of your psychic channels. 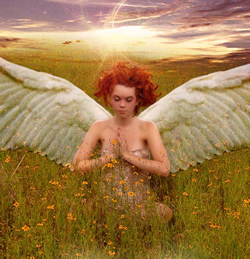 You may get information about your spirit guides, or the guardian angels around you. According to Doreen Virtue, fourth-generation metaphysician and angel communicator, everyone has at least two guardian angels around him or her. When you are in a receptive state, such as is the case when you are meditating, you may receive impressions or messages from these angels. Feeling pressure in the third eye chakra is also a common experience when meditating. The third eye chakra is an energy centre located between your eyebrows. It is your psychic communication centre and helps you receive clairvoyant information. When you first begin to work with meditation or anything that affects your psychic centre, it may begin to spontaneously open, and you will feel this as a light pressure between your eyebrows. If this happens, just acknowledge it, and then focus on your breathing. There are different types of meditations, different ways to meditate, and different ways to approach meditation. A simple way to start is to put on some quiet spa music and sit relaxed in a chair. Visualize white light around you, protecting you while you meditate, or use another protection technique if you have one that you use regularly. Take three deep breaths and exhale each slowly. Then regulate your breathing to a more natural pace, keeping in mind that abdominal breathing is preferable to shallow chest breathing. As thoughts about work or family or other concerns drift into your awareness, acknowledge them and let them go. Simply sit in awareness. Be interested, yet detached in whatever thoughts flow into your consciousness. There is no wrong way to meditate. If you find yourself focusing on an issue, and getting distracted by it, then return to focusing on your breathing. Practice for about ten minutes. As you get used to meditating, you will find that you can do it for longer periods of time. Group meditation helps to boost the energy of each person in the group, and some people have even experienced visions in common when meditating. When we meet with our meditation group, we discuss our experiences after each meditation. It is always interesting to hear what another person felt during meditation. Whether you practice by yourself or with a group, you will find yourself looking forward to those times of silence and solitude. Goldman, Jonathon, Healing Sounds: The Power of Harmonics, Rochester: Healing Arts Press, 2002.